For more than thirty years Rutland Clocks has been repairing, restoring and conserving 17th, 18th and 19th Century antique English and French clocks. 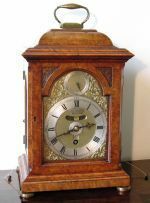 Our work is very varied and includes longcase grandfather clocks, bracket clocks and mantel clocks, dial clocks and tavern wall clocks and also French mantel clocks and carriage clocks. We collect and repair clocks from the East Midlands including Leicestershire, Northamptonshire, Cambridgeshire and Lincolnshire as well as further afield by arrangement. Please telephone or email for details. Our repair and restoration is always carried out sympathetically. Following inspection we will carry out the work you require and will advise on the extent of restoration applicable for dials and movements in keeping with best practice of conservation. 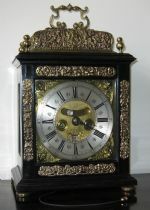 We offer restoration including clock dial re-painting or enamelling and the re-silvering and re-waxing of brass dials. We do not carry out case work at our workshops but we are always pleased to advise and can arrange for this to be carried out by a renowned local specialist. Antique clocks, with the use of modern lubricants, should run trouble free for up to ten years and to prevent wear and tear on the pivots and escape pallets it is advisable that they be serviced at regular intervals. Written estimates can be provided on request. All work carried out in our workshops is guaranteed for one year. 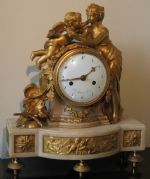 We always have fine English clocks and French clocks for sale, both privately and to the trade. Typical examples would be by Ellicott, Knibb, Loundes, Speakman, Tompion and Windmills. A selection of pictures of these can be viewed in our galleries and we can provide any further details you require.